Good afternoon everyone! It’s Monday and time to kick off another work weekend! We are experiencing some very warm weather, even will see 80’s tomorrow, so it feels like a good time to say bye to Winter and hello Spring! While I love my winter time, no snow and just dead everything can get quiet depressing at times. I’m ready for the bright colors, walks through botanical gardens, and warmer temps. To say goodbye to Winter I pulled out the Flake No More plate for an appropriate bye to Winter. For my goodbye winter mani I started off with two coats of City in the Clouds by Chaos & Crocodiles for a perfect Winter to Spring blue base. Next I used Flake No More plate from Pet’la Plates and Zombie Crush by SuperChic Lacquer. I sealed everything with two coats of Marvel Liquid Macro Top Coat by SuperChic Lacquer. Pretty stamping Nina! I love the dark purple! Thank you! It is certainly one of my favorite vampy shades! That is so pretty! The stamping turned out super-crisp. 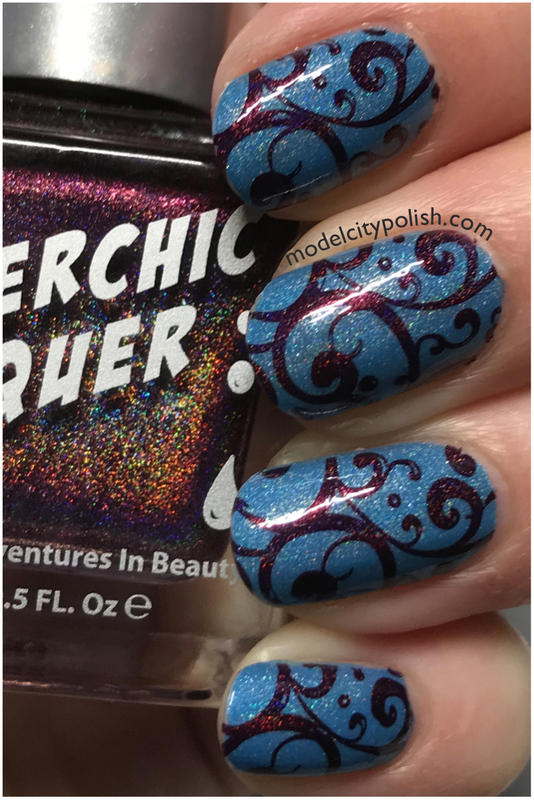 I love stamping with SuperChic’s holos!!! They are so pigmented and dry super quick! I love the stamping. I really like the color combo. Unexpected but gorgeous. It was a totally shot in the dark but after I did the first nail, I knew I had something! Loving it! I love the colors you used. They are so unique as is the combo. I’m ready to say goodbye to winter too. Thank you! I was really thrilled with how well they paired! This is a really pretty combination! I though we were saying goodbye to winter but just had a cold front come through today. Maybe I need to create a mani to encourage it to leave, hahaha! Hahahaha! It’s worth a shot! It’s been so warm here!! Oooo fun color combo and beautiful polishes! Not a combo I would have normally thought of but they really did work together beautifully! Beautiful mani! I love the crisp stamping. I like it!!! I hate to whine, but Phoenix has had winter for the last two weeks….I’m so over it. On IG, different area accounts are posting how we all love this weather…NOT THIS KID!! Bye winter, go away! Hahahaha! I guess you are having the opposite! Spring will be here soon! Thank you! It’s great to have such great products to work with! I love the color combo! Your stamping is perfect! 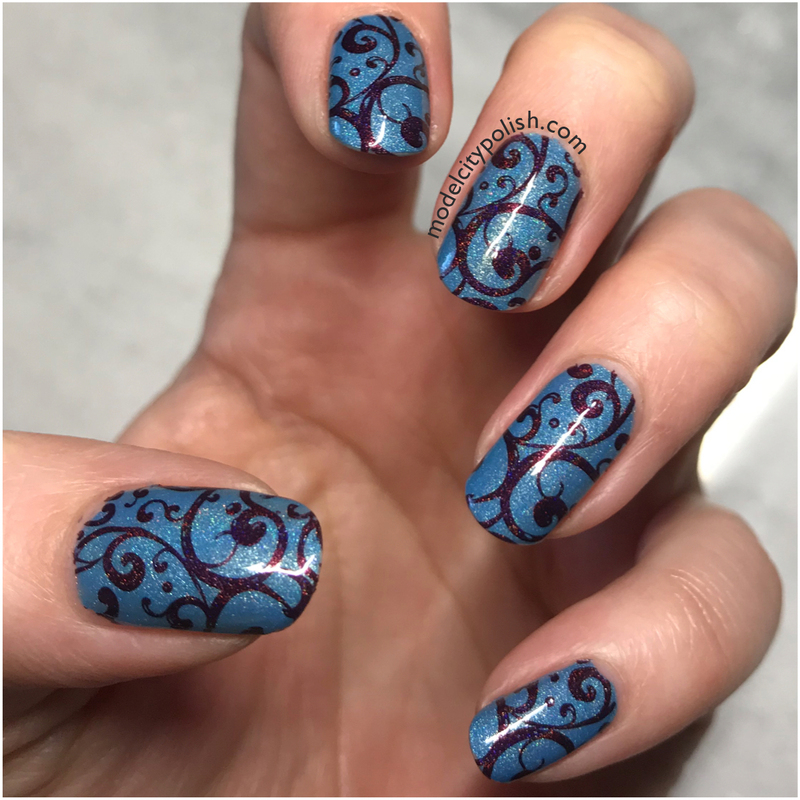 That stamping work is marvelous! I really like the combination of colors. Thank you! I wasn’t sure how well they would work together but with the first stamp I was in love! Thank you!!! I am really happy with the end look! 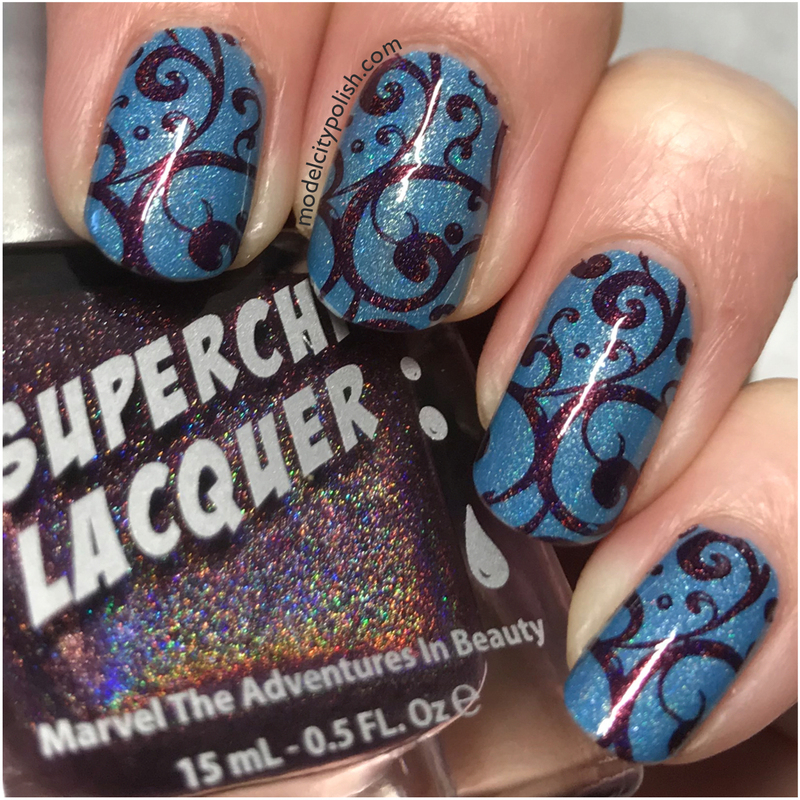 I really want to try Superchic – they are SO holo! Her holos are amazing!!! You won’t be disappointed!!! I agree: the contrast of these shades work so well together! I bet this was so sparkly in real life with all that holo! You know it!!! Give me all the glitter/holo/sparkle!!!!! Superchic Laquer has an AWESOME formula!! They really do and for stamping, amazing! They do have an amazing formula and for stamping….PERFECT!!! 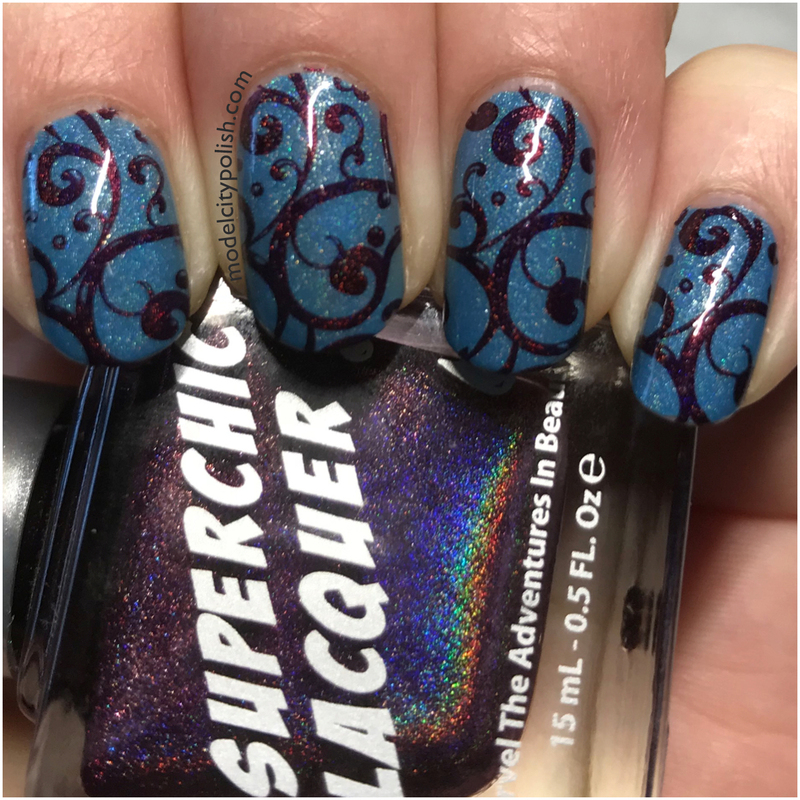 Wow, that holo stamping polish you used from Superchic Lacquer is stunning, and it stamped perfectly! This would make a gorg combination with a silver polish as well. Her holos always stamp beautifully! Best ones I’ve tried to date! I love this so much! The color combo is unexpectedly gorgeous. I totally got lucky with the color combo, it was a totally crap shoot!